In our experiments to improve the tolerance of Escherichia coli DH5α to heavy metals, we created a collection of several composite parts designed to combat oxidative stress. These parts mainly convey the ability to dismutate the superoxide anion and its secondary products like hydrogen peroxide into nontoxic forms. We were able to demonstrate that cells carrying our construct BBa_K2638118, containing the superoxide dismutase A and catalase under the control of a strong RBS and the pBAD promoter on pSB1C3, or BBa_K2638112, containing the glutathione synthase, the glutathione peroxidase and the glutathione reductase under the control of a strong RBS and the pBAD promoter on pSB1C3, are not subject to increased growth rate but to a significantly higher viability when the cells are exposed to elevated concentrations of heavy metals, namely CuSO4. The phytochelatin synthase produces phytochelatin which plays a major role in heavy metal detoxification processes in Arabidopsis thaliana. The phytochelatin synthase BBa_K2638150 was cloned into pSB1C3 in Escherichia Coli (E. coli) DH5α. For an enzyme assay it was cloned downstream of T7 promoter and upstream of an intein tag and chitin binding domain in E. coli ER2566. After overexpression and purification the protein was analyzed via SDS-PAGE and MALDI-TOF. An enzyme assay ensured the catalytic activity of the BBa_K2638150. The gene for the phytochelatin synthase (PCS1) has been ordered as gene synthesis from IDT. The gene synthesis was designed containing overlapping sequences to the iGEM standard backbone pSB1C3 to incorporate it directly via Gibson Assembly. The resulting BioBrick containing the phytochelatin synthetase is BBa_K2638150. After successful transformation in E. coli DH5α different promoters were used to construct different composite parts. The Anderson promoter of BBa_J23111 with the ribosomal binding site (RBS) BBa_B0030 was cloned upstream of the phytochelatin synthase for BBa_K2638152 as well as the pTet promoter BBa_R0040 and the RBS BBa_J61101 for BBa_K2638151. For inducible expression pBad/araC promoter BBa_I0500 was cloned together with the RBS BBa_B0030 for BioBrick BBa_K2638153. For characterization we wanted to overexpress and purify the phytochelatin synthase. Therefore, BBa_K2638150 was cloned downstream of a T7 promoter and fused to an intein tag and chitin binding domain. This construct was transformed into E. coli ER2566 and the phytochelatin synthase was overexpressed by induction of the T7 promoter. After cultivation, purification was carried out with the NEB IMPACT system. Briefly, the phytochelatin synthase was bound to the column with its chitin binding domain. Afterwards, washing the column with cleavage buffer resulted in self-cleavage of the intein leading to a separation of the protein from the column. The protein concentration was determined by Roti-Nanoquant assay,showing a protein concentration of 20.21 mg/mL. To confirm successful expression and purification the protein was loaded onto a SDS-PAGE (Figure 1). Figure 1: SDS-PAGE of the purified phytochelatin synthase (BBa_K2638150). Phytochelatin synthase was expressed and purified and loaded on a SDS-PAGE in different dilutions. Lanes 1 and 2 show a 1:6 dilution of the sample, lanes 3 and 4 show 1:12 dilutions, lanes 5 and 6 show 1:24 dilutions and lanes 7 and 8 show 1:48 dilutions. The holes show cut bands which were examined by MALDI-TOF. Red boxes mark the correct bands for the phytochelatin synthase. The SDS-PAGE shows an intense band at around 50 kDa. This band gets less intense in samples with a higher dilution but is still strongly present in the 1:48 dilution. As the phytochelatin synthase has a molecular weight of 53.946 kDa, this band indicates successful expression and purification of the enzyme. To proof that the band is indeed the phytochelatin synthase, matrix associated laser desorbtion ionization – time of flight analysis (MALDI-TOF mass spectrometry) was performed. Therefore, the bands were cut out as indicated and prepared as described for MALDI-TOF analysis (Figure 2). 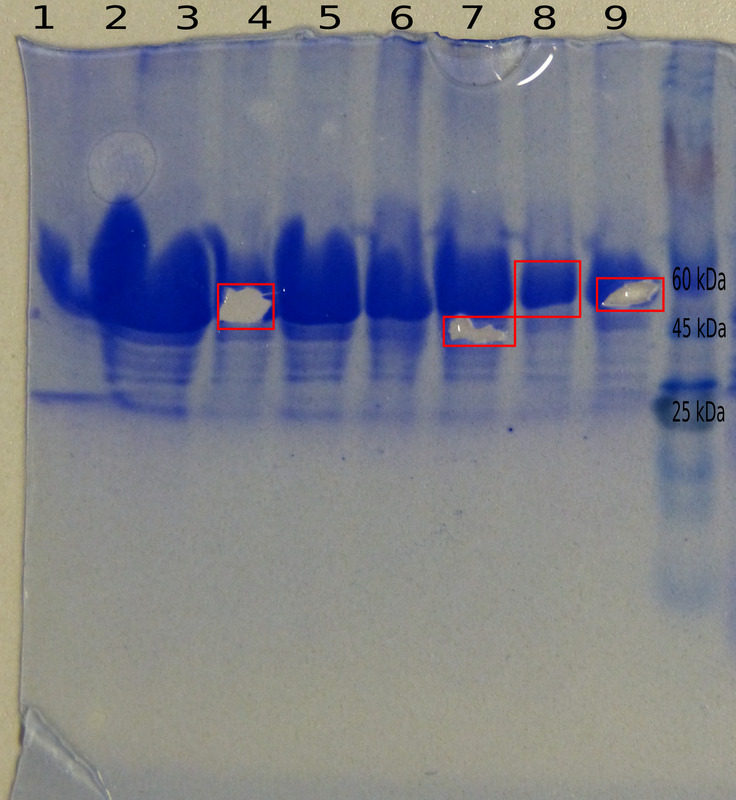 Figure 2: MALDI-TOF results of the phytochelatin synthase BBa_K2638150. 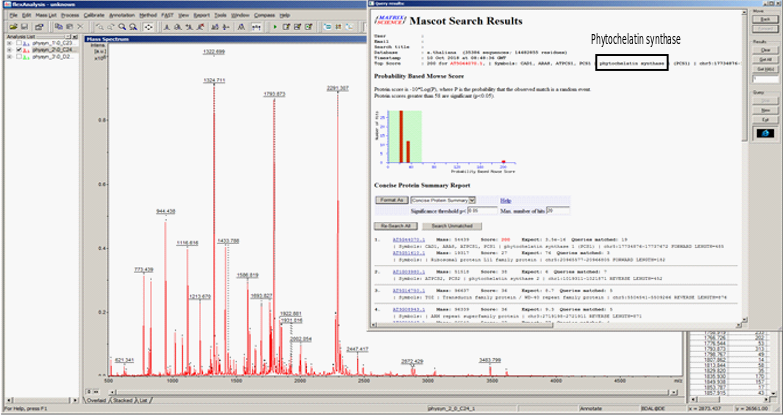 Purified phytochelatin synthase was analyzed by SDS-PAGE and characteristic bands were cut out and analyzed by MALDI-TOF mass spectrometry. Figure 2 shows the results of the MALDI-TOF measurements. Comparison with the Mascot database indicates that the examined sample is the phytochelatin synthase BBa_K2638150. In order to determine that the BioBrick BBa_K2638150 works as expected, an enzyme assay for the phythochelatin synthase (Chen et al.,1997) was conducted. The assay is based on the conversion of glutathione to phytochelatin. Therefore, the enzymatic in vitro assay was performed and afterwards the sample was measured with a liquid chromatography which was connected with a mass spectrometer. This was carried out via this protocol. For the enzyme assay three samples contained 1 mM GSH and another three samples contained 5 mM GSH as a substrate. The phytochelatin synthase was activated by adding 500 µM CdCl2. The last three samples contained 5 mM GSH and were activated by addition of 50 µM CuSO4. The blank sample contained no phytochelatin synthase but 500 µM CdCl2. Figure 3: Chromatogram of mass spectrometry connected with a liquid chromatography of glutathione and the different phytochelatins. The in vitro activity assay for the phytochelatin synthase was carried out as described and the reaction mixture was separated by liquid chromatography and analyzed by mass spectrometry. In figure 3 the different m/z ratio of the substrate glutathione and the different phytochelatins (PC) can be seen. The difference of the m/z ratio between glutathione and PC2 is about 232. The difference is the same between PC2, PC3, PC4 and PC5. This indicates product formation by subsequent transfer of a γ-Glu-Cys moiety onto glutathione or smaller chain phytochelatins leading to phytochelatins with a chain length of up to n = 5. This results show that the phytochelatin synthase is catalytically active. Figure 4: Chromatogram of liquid chromatography of glutathione and the different phytochelatins of the phytochelatin assay. Figure 4 shows the retention time of the substrate glutathione and the different phytochelatins. The chromatogram is from the assay sample with 1 mM glutathione. The highest peak is number 4 which is glutathione. This reveals that the substrate was still available in high amounts and not the whole amount of glutathione was converted to phytochelatins. Number 3 shows the second highest peak which is PC2 with a peak area of 479843. The peak area of peak number 1 is with 197103 more than half as high as peak number 3. The lowest peak area reveals peak number 2 with a peak area of 50905. It becomes obvious that the amount of phytochelatins decreases as the number of γ-Glu-Cys moieties in the phytochelatins increases. The whole overview of the samples can be seen in table 1. This table also shows that the three samples which were activated by CuSO4 contained PC2, PC3 and PC4. This suggests that the phytochelatin synthase can not only be activated by CdCl2 but also by CuSO4. In comparison with the Cadmium activated samples it becomes obvious that the peak area of the CuSO4 treated samples is lower. Table 1: Peak area as measured by liquid chromatography for glutathione or different phytochelatins for the reaction mixtures from the phytochelatin assay. 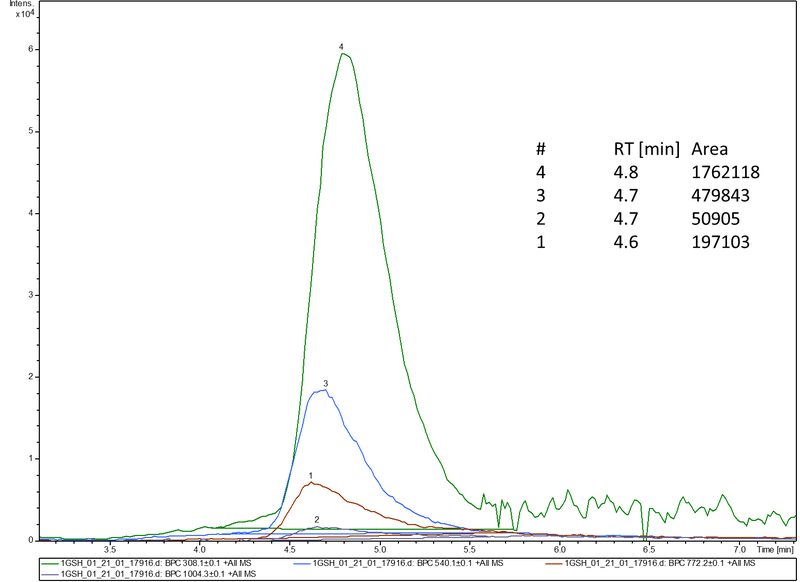 The phytochelatin assay was conducted with different starting amounts of glutathione and the phytochelatin synthase was activated by either 50 µM CuSO4 (line 8-10) or 500 µM CdCl2 (all other lines). The peak area shows abundance of the specific phytochelatins. Heavy metal exposure poses many risks and dangers to living organisms and the environment. Certain heavy metal ions such as copper can interact with enzymes and lower their activity as well as their specificity. Furthermore, heavy metals promoted reactive oxygen species (ROS) formation from processes such as Fenton chemistry and Haber-Weiss reactions. In our modeling regarding the accumulation of copper ions by the importer OprC, we came to the conclusion that the cells would have to incubate too long in the mining drainage, ultimately leading to cell death in a short period of time. Therefore, a sophisticated approach to increase the tolerance against heavy metals is desired which is necessary for cases where biological systems are deployed in heavy metal rich environments. Since we worked in our project with the heavy metals copper, silver, gold and iron, we evaluated several approaches of applying anti-oxidants against the generation of ROS. We decided to set a focus on the accumulation of copper ions due to its low costs and easy solubility. Additionally, its toxicity is lower than that of silver and gold. Hence there is a broader spectrum in which anti-toxic measures against the generation of ROS can be explored. Therefore, we tested our approaches on anti-oxidant measures in different concentrations of cupric salts. Subject to our research were the five following composite parts: BBa_K2638109 (pSB1C3+pTet+CRS5), BBa_K2638112 (pSB1C3+pBAD+gshB+gor+btuE), BBa_K2638114 (pSB1C3+pTet+soxR+oxyR), BBa_K2638110 (pSB1C3+gshB+pcs1) and BBa_K2638118 (pSB1C3+sodA+katG). Figure 5: Plot of the OD600 of E. coli DH5α incubated in LB medium and mining drainage at 37 °C and 350 rpm in a volume of 25 mL. As a first step, we investigated the influence of mining drainage on Escherichia coli (see figure 5). Therefore we performed a cultivation in LB media and mining drainage. The experiments showed no growth in the mining drainage, but a reduction of biomass due to the toxicity of the solution. Figure 6: Plot of the OD600 of E. coli DH5α carrying an empty pSB1C3 plasmid versus time with varying copper concentrations. Experiments were performed in a total volume of 1 mL LB medium supplemented with 30 ng/ml chloramphenicol in a 24-well plate at 37 °C and 350 rpm (n=3). To observe the toxicity of cupric ions on bacterial cells we cunducted growth experiments with different copper concentrations. 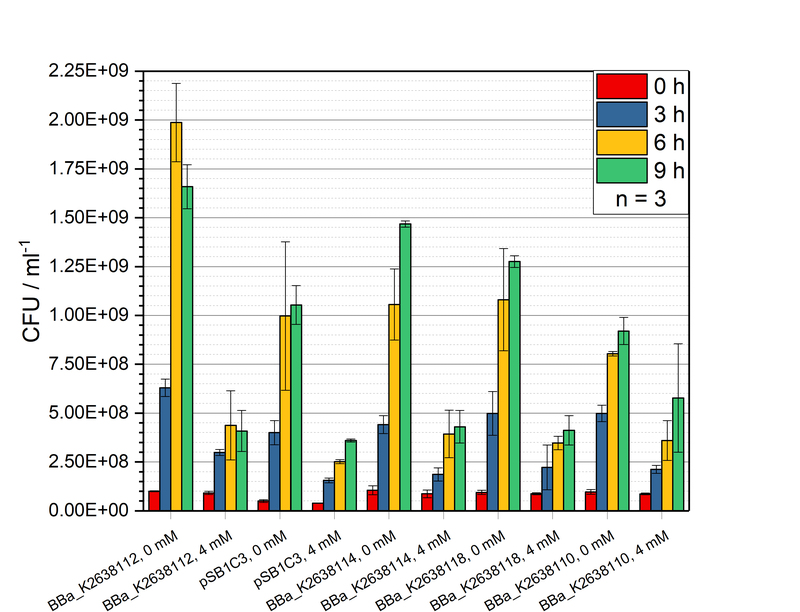 Escherichia coli DH5α carrying an empty pSB1C3 vector was grown in LB medium containing different concentrations of cupric salt over a period of 13 hours (figure 1). With no additional CuSO4 added the cells reached an optical density of 0.848 and entered the stationary phase after 6.5 hours. Small additions of cupric salt to the medium appeared to have a benevolent effect on the growth: concentrations of 1 mM and 2 mM CuSO4 resulted in a higher optical density of around 0.950. Growth started to deteriorate at a concentration of 4 mM CuSO4. The maximal growth rate µmax dropped to 7.54*10-3 min-1 in comparison to the growth in absence of CuSO4 (12.06*10-3 min-1) meaning it is only 62.52 % of the original µmax. Growth decreased even further with rising copper ion concentrations to 0.28*10-3 min-1 and 0.36*10-3 min-1. For the following examinations of antitoxic measures, three concentrations of cupric salts were chosen: 0 mM, 4 mM and 8 mM. As a control 0 mM was used. Since growth could still be observed at 4 mM CuSO4, even though growth was not as good as at lower concentrations of CuSO4, this concentration was chosen for further investigation as well. At 8 mM CuSO4, no significant growth was observed. Therefore, it was interesting to see whether more growth occurs or whether a higher viability can be achieved by applying our approaches for antitoxic measures. 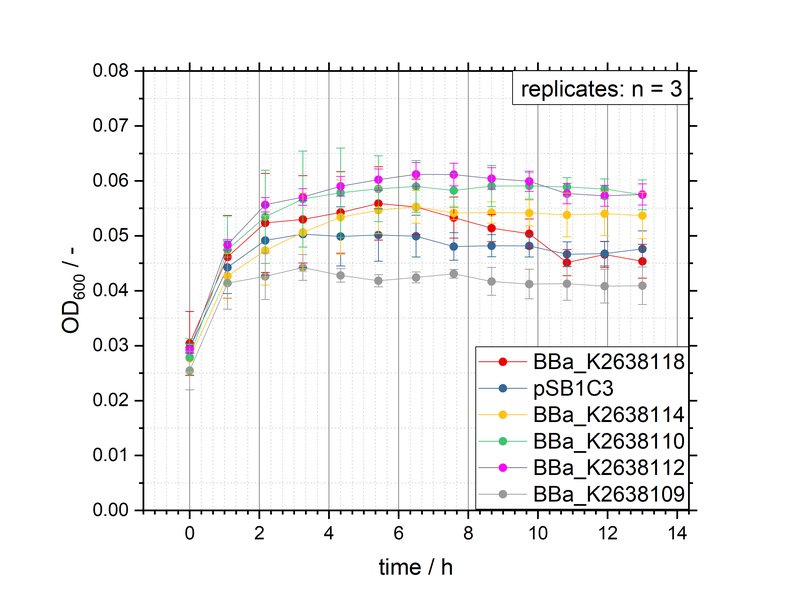 Figure 7: Plot of the OD600 of E. coli DH5α each carrying different biobricks versus cultivation time without CuSO4. Experiments were performed in a 24-well plate in a volume of 1 ml LB medium supplemented with 30 ng/ml chloramphenicol at 37 °C and 350 rpm (n=3). The BioBricks carried either the gene for metallothionein (BBa_K2638109), for a superoxide dismutase and a catalase (BBa_K2638118), for glutathione reductase, glutathione peroxidase and glutathione synthetase (BBa_K2638112), for the glutathione synthetase and phytochelatin synthase (BBa_K2638110) or for the regulars for the cellular response to oxidative stress (BBa_K2638114). This experiment was conducted in order to examine the influence of the constructs on the growth behavior of E. coli in general. The growth of strains carrying the constructs mentioned in figure 7 in absence of cupric salt was examined. No significant difference between the highest OD600 values of the cells could be observed. However, cells carrying plasmids under the control of the pBAD promoter (BBa_K2638112) showed a different growth pattern since they can rely on another carbon source other than those regularly appearing in LB medium. 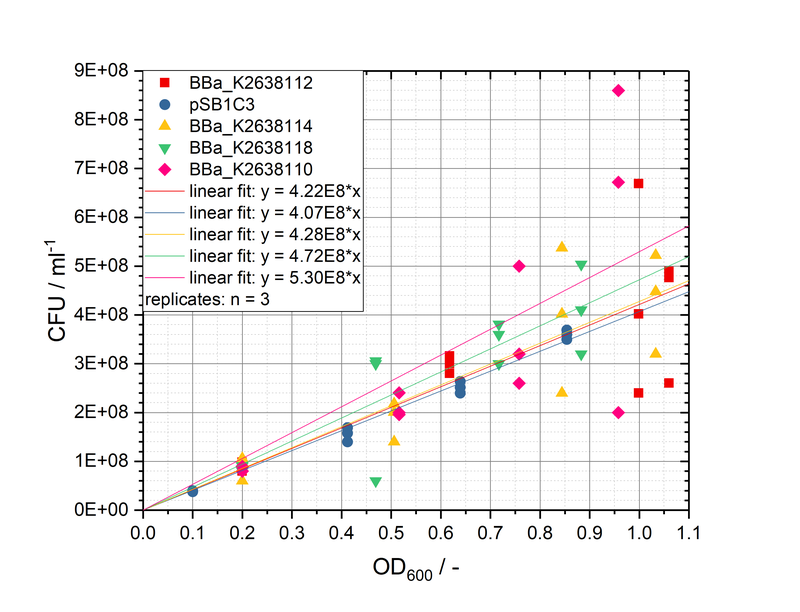 This leads to two consecutive exponential phases resulting in similar OD600 values compared to those only relying solely on the carbon sources of LB medium. Other than that, no significant changes in growth behaviour were observed. Figure 8: Plot of the OD600 of E. coli DH5α each carrying different plasmids versus time in a volume of 1 mL LB medium supplemented with 30 ng/ml chloramphenicol containing 4 mM CuSO4. Experiments were performed in a 24-well plate at 37 °C and 350 rpm (n=3). The BioBricks carried either the gene for metallothionein (BBa_K2638109), for a superoxide dismutase and a catalase (BBa_K2638118), for glutathione reductase, glutathione peroxidase and glutathione synthetase (BBa_K2638112), for the glutathione synthetase and phytochelatin synthase (BBa_K2638110) or for the regulars for the cellular response to oxidative stress (BBa_K2638114). This experiment was conducted to evaluate the general effect of the applied constructs on growth in presence of CuSO4. No mutant carrying any of the BioBricks shown in figure 8 exhibits an advantage regarding the growth rate or the final OD600 value compared to the strain carrying the empty plasmid. While BBa_K2638110 and BBa_K2638114 exhibit the same growth pattern as the strain carrying an empty pSB1C3 vector implying that these BioBricks do not exhibit any effect on the resistance against elevated concentrations of copper ions. BBa_K2638112 and BBa_K2638109 however showed significant lower growth rates and did not reach an OD600 value as high as the other strains. Therefore, they appear to posses a negative effect on the resistance against copper ions. The construct BBa_K2638118 does not differ significantly from the strain with the empty vector and does not reach an OD600 value as high. A negative effect on the copper resistance can therefore not be excluded. 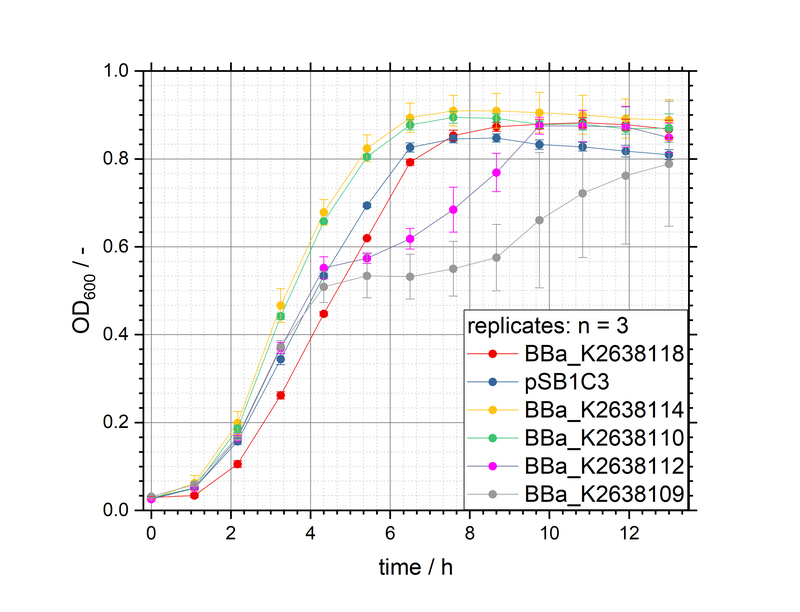 Figure 9: Plot of the OD600 of E. coli DH5α each carrying different plasmid versus time. Experiments were performed in a 24-well plate in a volume of 1 mL LB medium supplemented with 30 ng/ml chloramphenicol and 8 mM CuSO4 at 37 °C and 350 rpm (n=3). The BioBricks carried either the gene for metallothionein (BBa_K2638109), for a superoxide dismutase and a catalase (BBa_K2638118), for glutathione reductase, glutathione peroxidase and glutathione synthetase (BBa_K2638112), for the glutathione synthetase and phytochelatin synthase (BBa_K2638110) or for the regulars for the cellular response to oxidative stress (BBa_K2638114). 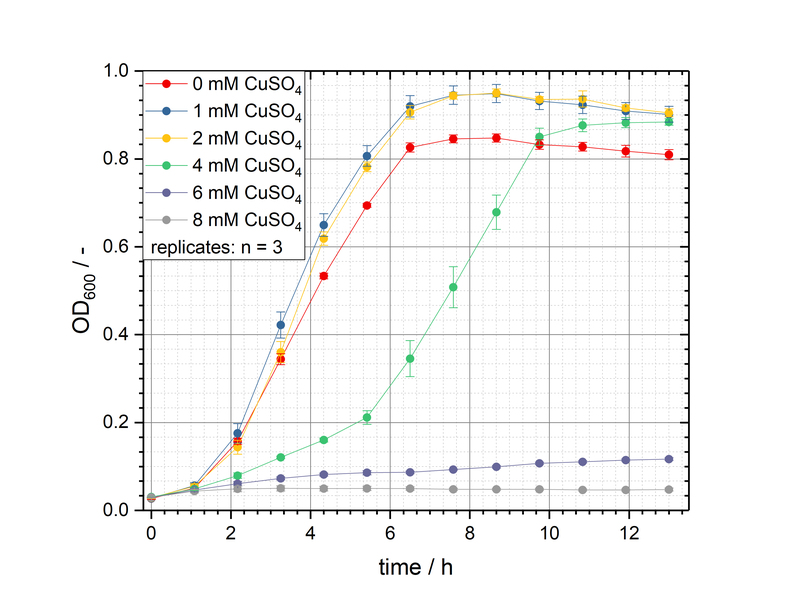 To evaluate the effect of the constructs in concentrations of CuSO4 lethal to E. coli, we observed the growth of the strains mentioned in figure 9 in LB medium containing 8 mM CuSO4. The results can be viewed in figure 9. Every strain showed visible growth only during the first two hours at best. Afterwards, there was no significant increase in the OD600 value. 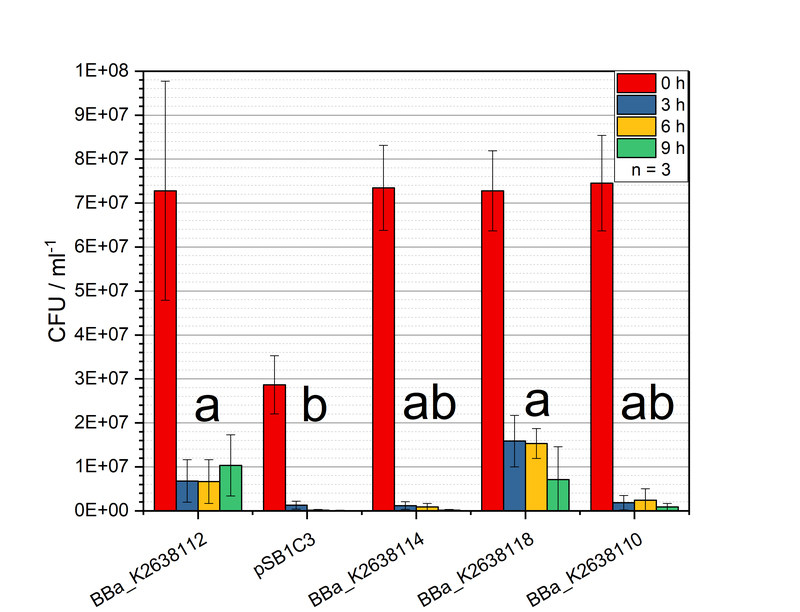 The highest OD600 values were achieved by the construct BBa_K2638112, carrying the genes gor, btuE and gshB, the lowest OD600 values by the construct BBa_K2638109, carrying the gene crs5. However, since no growth improving effect could be observed in our previous experiment, we decided to conduct an experiment based on the viability of the cells at the measured points of time at the beginning of the experiment and after three, six and 9 hours of cultivation. We grew E. coli containing the constructs BBa_K2638112, BBa_K2638110, BBa_K2638110, BBa_K2638118 and pSB1C3 in 10 ml LB medium supplemented with 30 ng/ml chloramphenicol for 9 hours and either 0 mM, 4 mM or 8 mM CuSO4. Every three hours, a sample was taken and 50 µl were plated in the following dilutions: 10-4, 10-5 and 10-6. Additionally, whenever a sample was taken, the optical density at 600 nm was measured. In order to validate our results, we correlated the optical density and the determined CFU (Colony Forming Units). 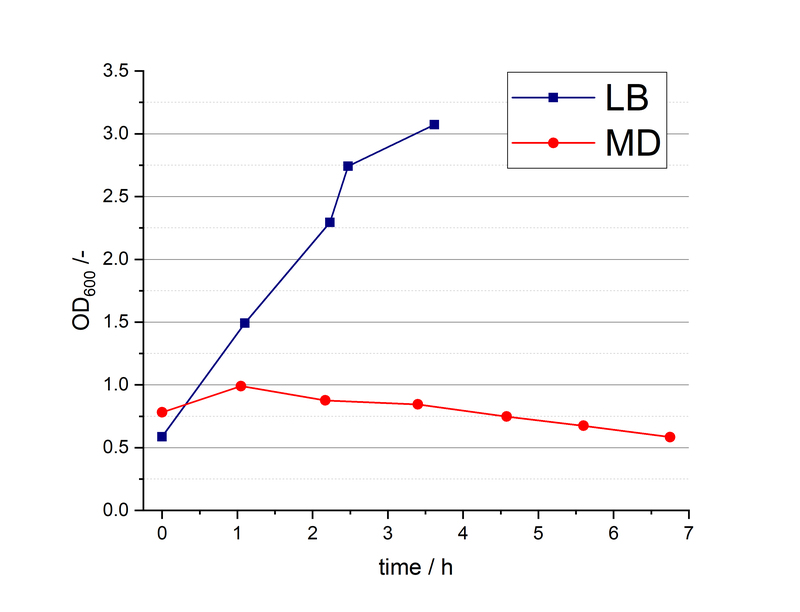 Figure 10: Plot of the optical density at 600 nm of cells grown in LB medium containing 30 ng/ml chloramphenicol and no cupric salt at 37 °C against the amount of colony forming units (CFU) in ml-1, as well as linear fits (n=3). The BioBricks carried either the gene for metallothionein (BBa_K2638109), for a superoxide dismutase and a catalase (BBa_K2638118), for glutathione reductase, glutathione peroxidase and glutathione synthetase (BBa_K2638112), for the glutathione synthetase and phytochelatin synthase (BBa_K2638110) or for the regulars for the cellular response to oxidative stress (BBa_K2638114). The OD600 clearly correlates with the amount of colony forming units (CFU) when no further CuSO4 was added to the medium. The coefficient of determination R2 indicates a correlation between the optical density and the CFU with a value of at least 90 %. In certain cases, the R2 value exceeds 97.3 %. The Pearson correlation coefficient R of the different constructs can be found in the table below, indicating a significant positive correlation between the two values. Table 2: R and R2 values. The same measurements were performed for cells at CuSO4 concentrations of 4 mM and 8 mM. The linear fits for the constructs grown in both media are shown in figures 10 and 11. Figure 11: Plot of the optical density at 600 nm of cells grown in LB medium containing 30 ng/ml chloramphenicol and 4 mM CuSO4 at 37 °C against the amount of colony forming units (CFU) in ml-1, as well as linear fits (n=3). The BioBricks carried either the gene for metallothionein (BBa_K2638109), for a superoxide dismutase and a catalase (BBa_K2638118), for glutathione reductase, glutathione peroxidase and glutathione synthetase (BBa_K2638112), for the glutathione synthetase and phytochelatin synthase (BBa_K2638110) or for the regulars for the cellular response to oxidative stress (BBa_K2638114). A positive correlation was indicated by determining the Pearson correlation coefficient R and the coefficient for determination for the different R2 constructs. However, according to its coefficient of determination, in the case of BBa_K2638110 only 83.7 % of all changes of the optical density could be referred to the changes in the amount of colony forming units,. according to its coefficient of determination. In general, a positive correlation between the optical density and the CFU could be clearly determined. Table 3: R and R2 values. In contrast to those cells grown in the absence of CuSO4 and in the presence of 4 mM CuSO4, no positive correlation between the optical density and the CFU could be observed. Instead, the cells grown in LB medium with 8 mM CuSO4 were proven to show a negative correlation, clearly demonstrating the lethal effect on cells. This is clearly visible in figure 12 (see below). Figure 12: Plot of the optical density at 600 nm of cells grown in LB medium containing 30 ng/ml chloramphenicol and 8 mM CuSO4 at 37 °C against the amount of colony forming units (CFU) in ml-1, as well as linear fits (n=3). The BioBricks carried either the gene for metallothionein (BBa_K2638109), for a superoxide dismutase and a catalase (BBa_K2638118), for glutathione reductase, glutathione peroxidase and glutathione synthetase (BBa_K2638112), for the glutathione synthetase and phytochelatin synthase (BBa_K2638110) or for the regulars for the cellular response to oxidative stress (BBa_K2638114). The negative correlation was revealed by Pearson correlation coefficient R and coefficient of determination R2. Table 4: R and R2 values. 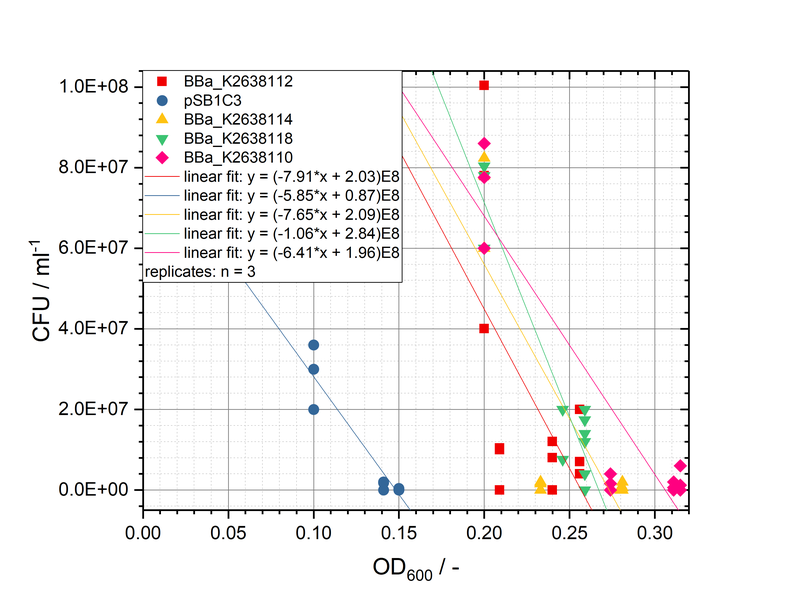 R2 was less than half as big as the R2 values of the other constructs and of all constructs at different concentrations of CuSO4. The negative correlation was likely due to cells dying at higher copper concentrations but not being degraded immediately so that the OD600 value suggests a higher cell density than viability. Therefore, the correlation of every construct shifts to the negative area. Furthermore, the highest R and R2 values have been determined for the mutant carrying the empty pSB1C3 vector. Figure 13: Bar chart of the CFUs of the tested constructs in LB medium supplemented with either 0 mM or 4 mM CuSO4 at 37 °C (n=3). No significant difference in growth or viability in comparison to the empty pSB1C3 vector was observed for any tested construct at a concentration of either 0 mM or 4 mM CuSO4. According to the previously recorded growth trends, the growth rate decreased visibly with a rising concentration of copper ions. However, since no effect significantly improving the amount of colony forming units compared to the wildtype could be determined for these concentrations, the CFU at 8 mM CuSO4 was evaluated. 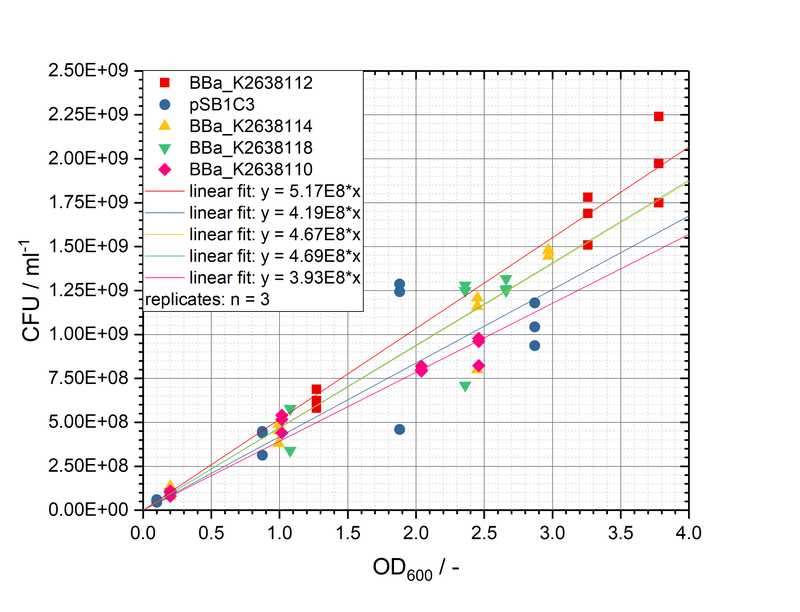 Figure 14: Bar chart of the CFUs of the tested constructs in LB medium supplemented with 8 mM CuSO4 at 37 °C (n=3), as well as the assigned significance levels to explain which constructs differ significantly from each other. The number of colony forming units at the beginning of the measurement, after 0 hours, already shows indicates a great difference. Furthermore, the CFU in the course of time reveals differences for certain constructs in comparison to the wildtype. 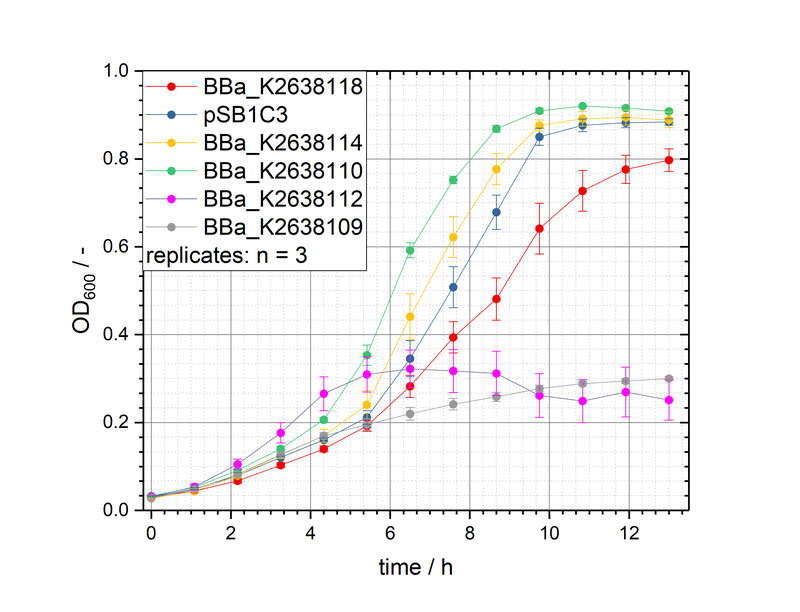 BBa_K2638112 and BBa_K2638118 appear to be more viable after 3, 6 and 9 hours of cultivation in 8 mM CuSO4 containing medium. However, since no growth appeared to occur, the evaluation of this data concentrates on the preservation of the existing biomass rather than to improve its growth capabilities. After all, the cells are meant to be incubated and not cultivated in our remediation process of filtering water. To examine the collected data regarding the influence of time and tested constructs, we conducted a two-factor ANOVA (analysis of variance) with repeated measurements for both factors. The aim is to discard the null hypothesis stating that there is no significant difference between the temporal developments of the tested constructs. Therefore, we conducted Mauchly’s Test of Sphericity to determine the samples sphericity.  The test suggested highly with high significance to accept the assumption of sphericity with a significance level of .000 meaning that a correction of values by Greenhouse-Geisser was needed. The test of Within-Subject Effects resulted in the conclusion that the applied construct as well as the combination of the temporal development and the construct has a significant influence on the amount of colony forming units. In case of the construct, the influence was determined to be even highly significant. The constructs, the temporal development and the combination of those factors were examined, and each assigned to a significance level. In conclusion, we were able to develop two composite parts which increase a cell’s tolerance for elevated concentrations of copper. This ameliorated tolerance could be verified for concentrations up to 8 mM of CuSO4 for a duration of up to 9 hours. This is a great first approach to realize our project and enable our cells to survive longer in the mining drainage. As our composite can also be used by iGEM teams in the future, we deem these results to be very useful to the community. Further applications could also be in the remediation of contaminated soils and seas, as well as industrial applications and processes in a heavy metal rich environment.